We look forward to welcoming you in 2018 for the next edition! 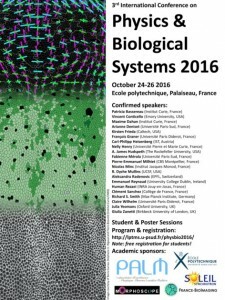 The 3rd International Conference on Physics and Biological Systems will be held on October 24-26th 2016 at École polytechnique in Palaiseau – greater Paris area. It aims to bring together a broad range of physical and life scientists working at the interface between the two disciplines around in-depth talks by first-rate international speakers. Attendance will be limited to 200 participants. We look forward to welcoming you in Palaiseau!